Listings also include luxury listings found in the subdivision of Canyon Meadows Estates. Homes for sale in Canyon Meadows range from condos and townhomes in the low $200,000’s to homes from the mid $300's all the way up to estate and luxury homes of $1.5 Million or more found in Canyon Meadows Estates. Select your price range or specific Canyon Meadows real estate listings below. 39 Properties Found. Page 1 of 1. #67, 330 Canterbury DR SW C4226886 Please Click Brochure for more photos, floor plans and much more! NICE AND COZY BUNGALOW STYLE TOWNHOUSE. FEATURES TWO GOOD SIZE BEDROOMS, 1 BATH WITH DUAL SINK. WALKING DISTANCE TO FISH CREEK PARK, TRANSIT ETC. GREAT LOCATION AND WELL PRICED. Canyon Meadows is an idyllic residential neighborhood nestled within the south-west quadrant of Calgary. The community is surrounded by 14 Street W on the west, the Canyon Meadows Drive on the south, the MacLeod trail on the east and the Anderson Road on the east. With the Fish Creek Provincial Park immediately south of it and the Canyon Meadows golf course to the north-west, the community in Canyon Meadows is a perfect place to start a family, raise your kids or spend a tranquil life post-retirement. 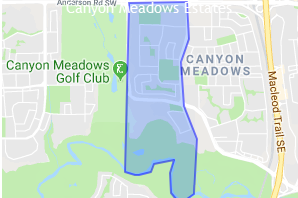 Established in 1965, the Canyon Meadows Real Estate majorly comprises of single-family attached and detached units with a few apartment condominiums developed only in the last decade. Homes for Sale in Canyon Meadows are available are available within a price range of $185,000 and around $500,000. Situated in southwest Calgary, Canyon Meadows features affordable and comfortable living options. To the east of the community is Lake Fraser Drive, while Macleod Trail SW runs along the western border. Canyon Meadows Drive is at the southern border of this community. Anderson Road marks the northern border of Canyon Meadows. Development of the Canyon Meadows community started and continued throughout the 1960s. At Canyon Meadows, homes for sale include a mixture of starter, luxury, and moderately priced condos. A wide range of options in terms of pricing is available starting from 1.9 million to $273k. For schools for specific Canyon Meadows homes, please refer to the designated schools search tool on the Calgary Board of Education website. For a Report Card on School Rankings of Calgary Schools get in touch with one of our Canyon Meadows Real Estate agents. A Catholic elementary school operating in the communities of Legacy and Canyon Meadows, St. Catherine School provides elementary education from Kindergarten to Grade 6 with an additional pre-school program as well. A part of the Calgary Catholic School District, St Gerard is one of the many popular French Immersion Schools in the city. A family-friendly school, it caters to the educational needs of more than 20 residential communities in South west Calgary. The school is confident that your children will flourish in a safe, welcoming, engaging and Christian faith learning environment at St. Stephen. Located in the SE community of Acadia, St. Matthew School offers a variety of learning programs including English, Late and Early French Immersion as well as Educational Support II. The Bishop Grandlin High School offers a safe and positive Catholic community which encourages the students to achieve success in academics, hone their skills in the many extracurricular programs and promote spiritual development. Listing information last updated on April 18th, 2019 at 2:15pm MDT.